LA FÊTE NATIONAL forms the centrepiece of the Parisian summer. It’s the French National Day and it commemorates the 1790 Fete de la Federation, held on the first anniversary of the storming of the Bastille on July 14, 1789. It also marks the start of the French holiday season. In Paris the day starts with the défilé, the parade of military and civilian services, marching down the Champs Elysées to be reviewed by the Président de la République and his army of guests. 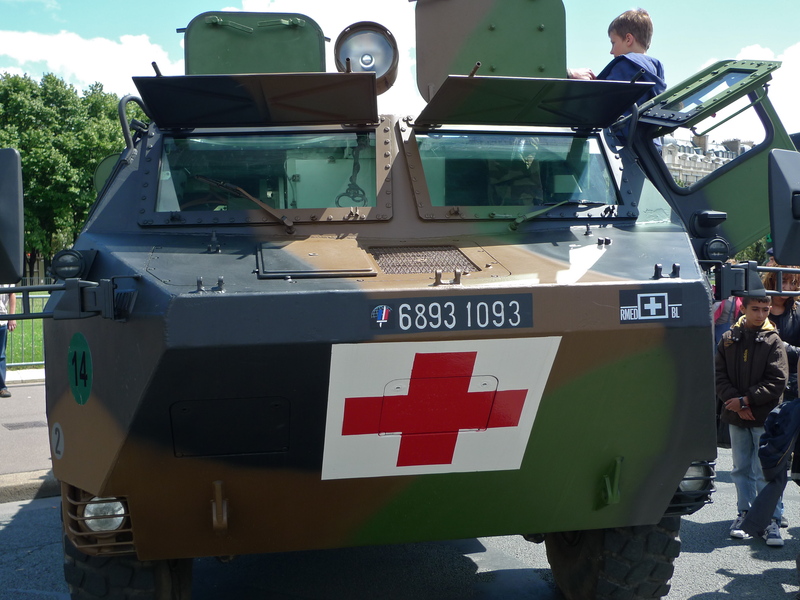 In the Champs Elysées this year the défilé comprised 3,752 men and women from the military and civilian services, 285 vehicles, 82 motorcycles, 76 dogs and 241 horses from the Garde Républicain. This year marks the centenary of the outbreak of the First World War and among those taking part in the défilé were representatives of 80 countries who fought in that conflict. This year also marks the 80th anniversary of the founding of l’armée de l’Air, the French Air Force and, in a spectacular display of precision flying, 54 aircraft led by nine Alpha Jets of the Patrouille de France, the French aerobatic display team, approached over La Défense in the west of Paris and flew along the Avenue Charles de Gaulle, the Avenue de la Grand Armée and into the Champs Elysées. 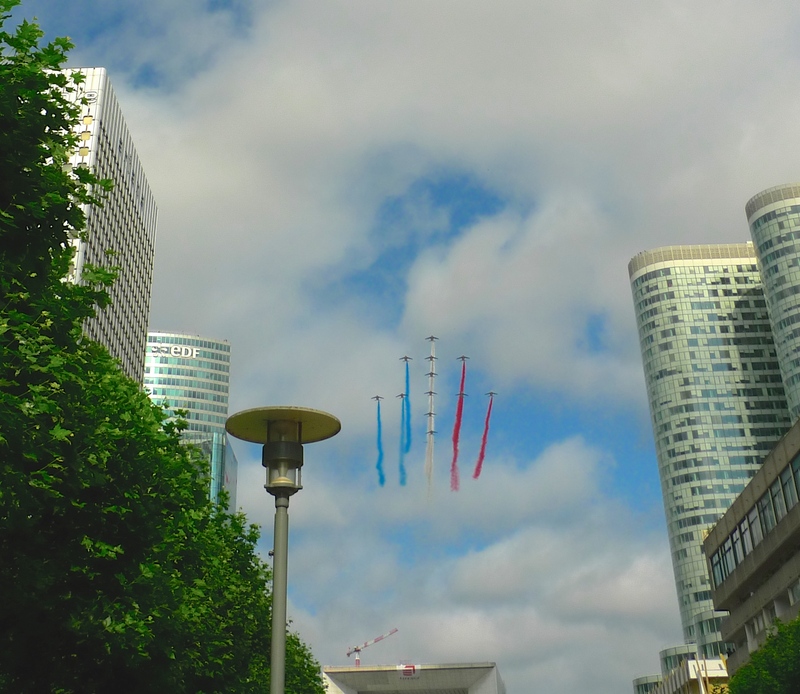 Being both a sound and an aircraft enthusiast I record this fly-past each year and this year I decided to record it from the Esplanade de la Défense. 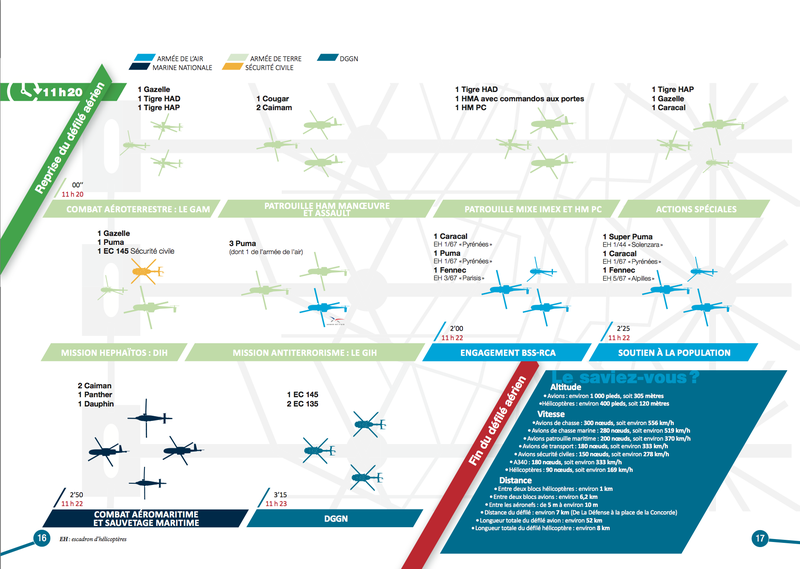 Getting 54 aircraft of different sizes, weights and speeds into exactly the right place at exactly the right time is a complex business but each year the French Air Force accomplishes it faultlessly. 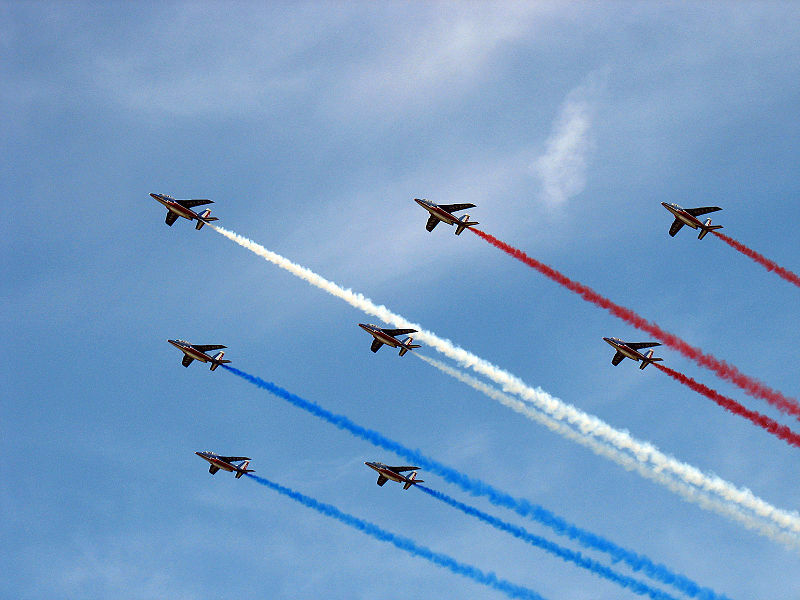 If the défilé in the Champs Elysées is to proceed seamlessly, the first aircraft, the Patrouille de France, have to appear over the plus belle avenue du monde trailing their bleu-blanc-rouge, blue, white and red smoke, at exactly 10.36 am and the last aircraft must arrive 8 minutes and 30 seconds later. 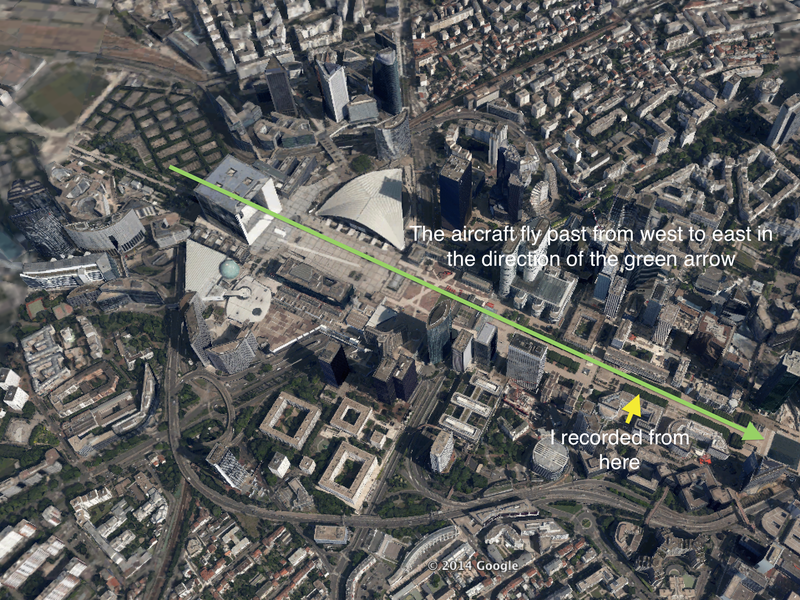 For this to happen, the aircraft have to arrive at la Grande Arche de la Défense at precisely the right time, at the right speed and with exactly the right separation between each aircraft or groups of aircraft even though they are all flying in from different places. The way they do it is similar to the way that air traffic controllers bring commercial airliners in to land at busy airports. The aircraft are directed to fly a given route at a given speed and then at a pre-determined point they are fed from different directions into a single stream taking into account their size, speed and wake turbulence. For a military fly-past like this one over the Champs Elysées though there is a further complication. 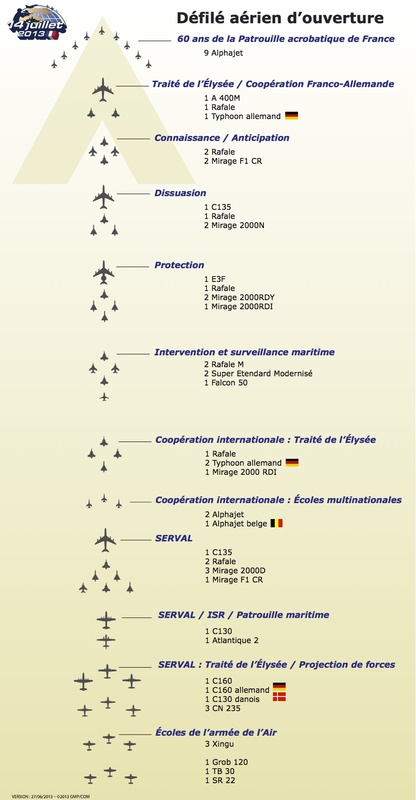 Some of the aircraft fly in clusters; the Patrouille de France for example flew in a formation of nine aircraft, the large E3F aircraft with its flying radar dome had three fighter aircraft flying close behind it and the KC135 tanker aircraft had two fighter aircraft flying either side of its tail. These clusters of aircraft have to get into formation and effectively fly as one aircraft as they turn into the stream. 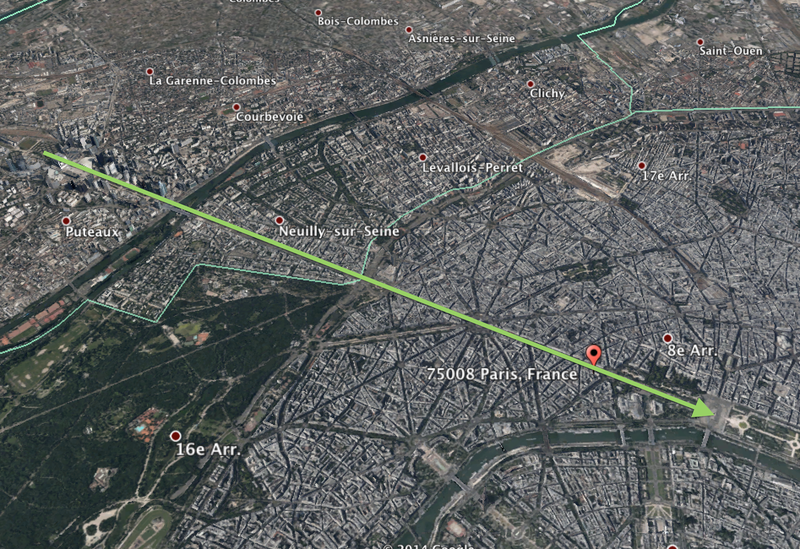 Once in the stream and heading for the Champs Elysées the pilots, as well as keeping a constant height and compensating for the wind speed and direction, must maintain their allotted separation from each other. While it’s just about acceptable for an experienced fast-jet pilot to fly a relatively small fighter aircraft dangerously close to a much larger four-engine tanker aircraft for example, it would be catastrophic for a smaller propeller-driven aircraft to try to do the same, the wake turbulence from the larger aircraft could overturn the smaller aircraft in the blink of an eye. It was with all these things in mind that I settled down to record the aircraft fly-past. I was fascinated to watch how all the aircraft entered the stream. The turning point was just beyond la Grande Arche de la Défense and just as with the approach to commercial airports, they approached from the left, the right and from straight ahead. 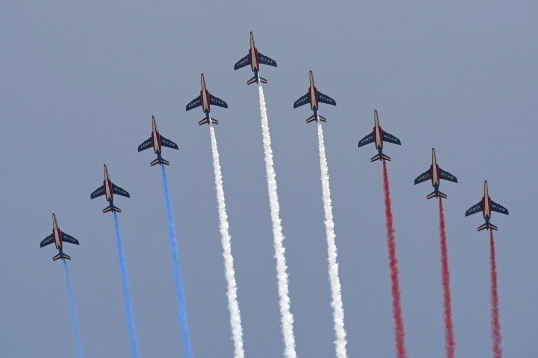 The Patrouille de France were the first to appear from the far distance. Nine Alpha Jets in perfect formation with their landing lights blazing from the front and blue, white and red smoke issuing from behind. Alpha Jets have a very special sound and by the time they passed me the next cluster of aggressive fast jets were approaching. From then on it was pure theatre – clusters of aircraft turning in from the left followed by more coming from the right punctuated by those coming from directly ahead, all with perfect timing, perfect separation and all culminating in a faultless display of military might over the Champs Elysées. If you listen to the sounds I recorded you will probably notice several things. Of course, you will hear the distinctive voices of each aircraft as they pass overhead but you will also hear the subtle differences in the critical separation of the aircraft clusters. In the relatively quiet separation pauses you will hear the sound of young children. As with my recording of the same event last year, I find that the juxtaposition of the voices of innocent young children on the ground and the mighty war machines flying overhead speaks volumes. For those of you with an eye for detail, you will also find that the time taken from the first aircraft passing overhead to the last is exactly 8 minutes and 30 seconds, exactly as it should be. 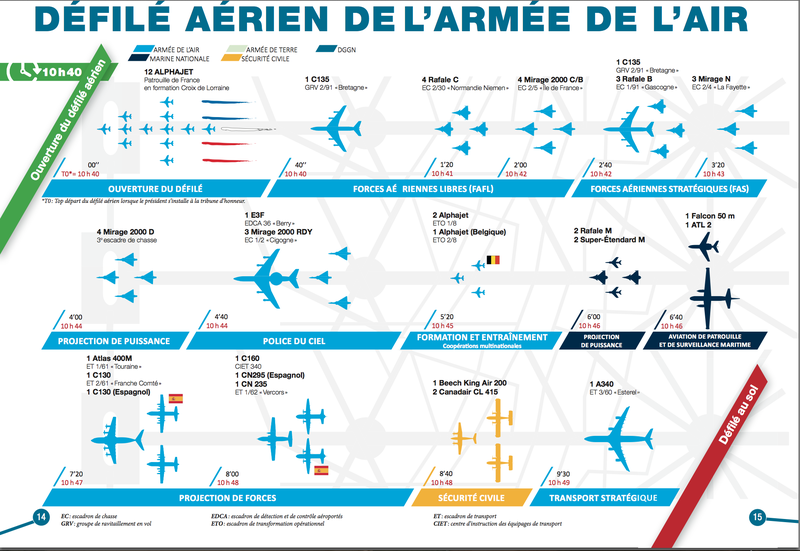 All these aircraft passing in what I call a fly-past, is officially known as the Défilé arien d’ouverture (the opening aerial parade would be a rough translation) but that implies that more was to follow. And indeed there was. 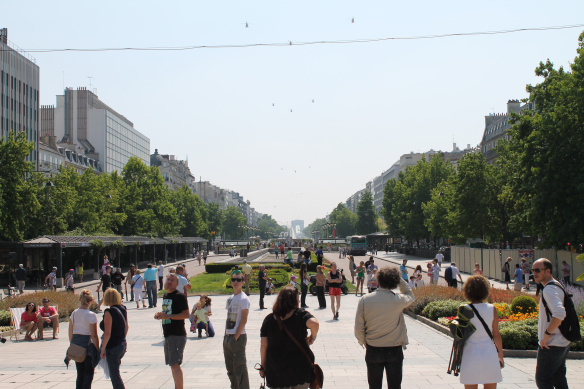 At 11.20 precisely, a stream of 36 helicopters was scheduled to pass over the Champs Elysées in what is called the Défilé arien de cloture. Still at my recording position on the Esplanade de La Défense I waited until they appeared. Getting the helicopters into a stream is much less complicated than with the aircraft. All 36 helicopters approached me from over la Grande Arche in a single line and I could see all of them as they passed over me and headed to the Champs Elysées. 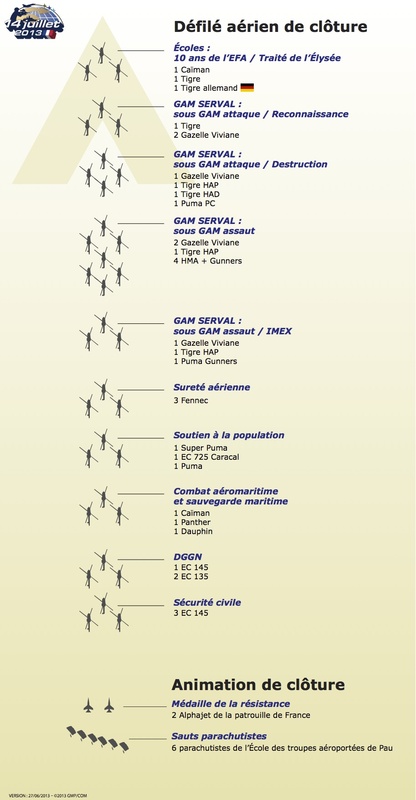 The stream of 36 helicopters included 21 from l’aviation légère de l’armée de Terre, 6 from l’armée de l’Air, 3 from la Marine nationale, 3 from la Gendarmerie nationale and 3 from la sécurité civile. 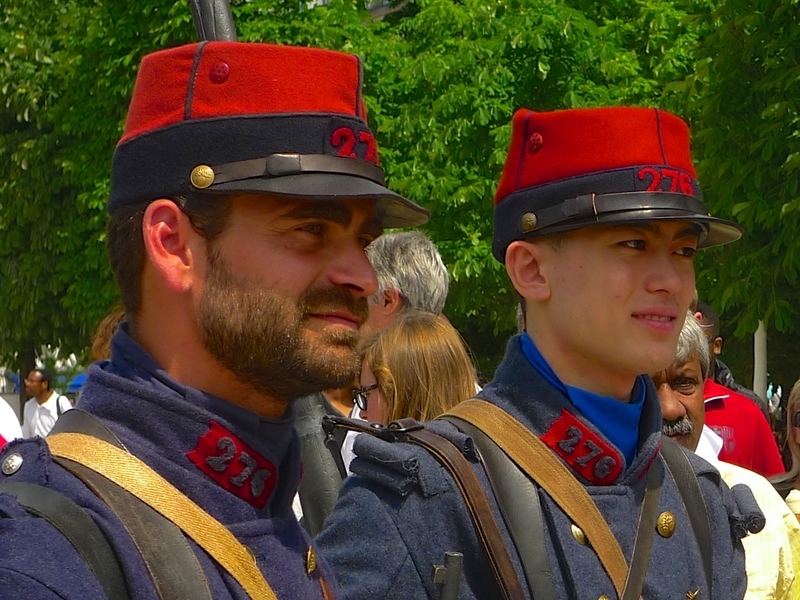 In previous years I’ve spent the afternoon of la Fête Nationale visiting the Franciliens accueillent leur soldats displays that pop up around Paris. But this year I came upon something a little different. 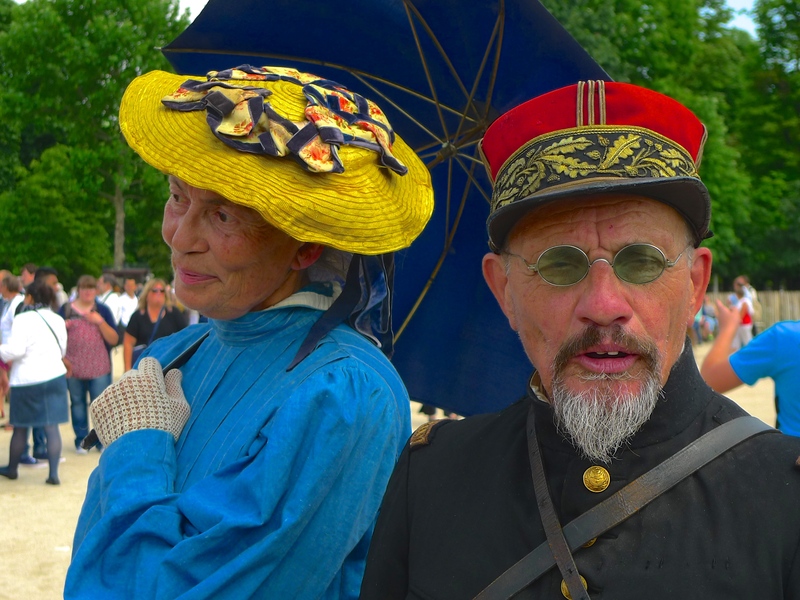 Bearing in mind that this year is the centenary anniversary of the outbreak of the First World War I went to the Jardin des Tuileries where I came upon a display of First World War vehicles and memorabilia including men and women dressed in costumes of the period. 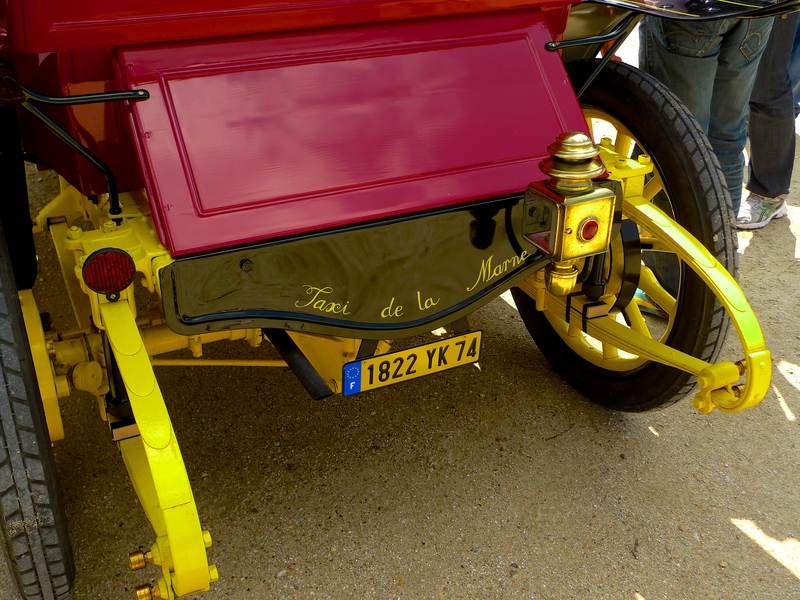 But what really caught my eye were two magnificent examples of original Taxis de la Marne, Marne Taxis. 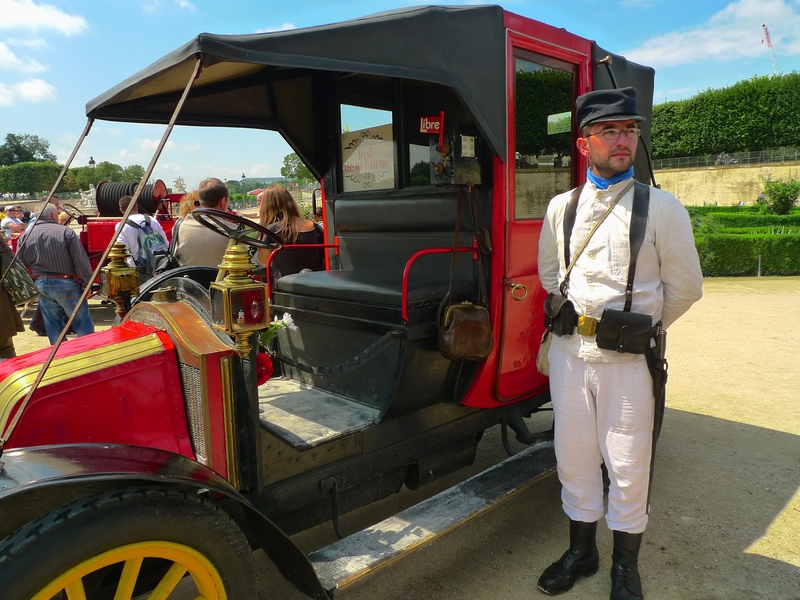 What we now refer to as Marne Taxis were originally the Renault Type AG Parisian taxicabs designed by Louis Renault and built between 1905 and 1910. 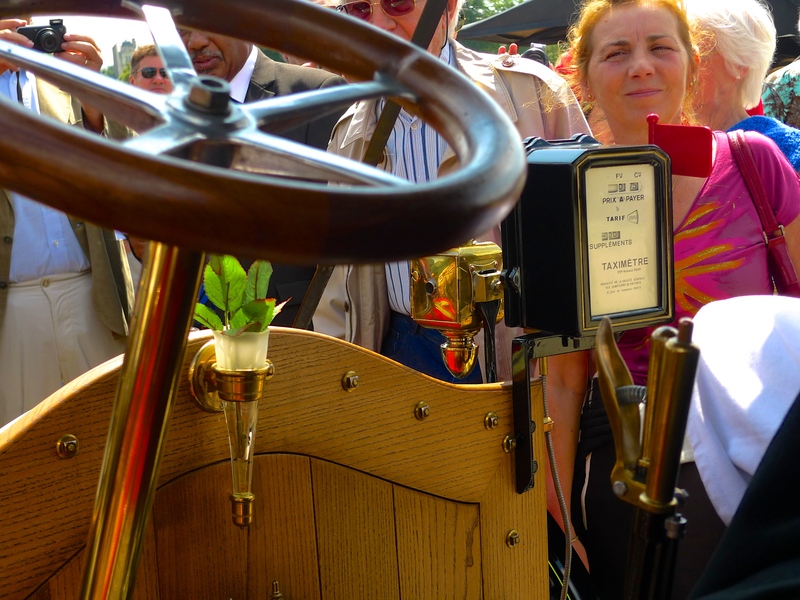 The 1,205 cc, two-cylinder, 12 horsepower, Renault AG was a robust motor car for its time but it became really popular during these years thanks to a car-rental company who ordered 1,500 of them to which they attached a new invention, the taximétre or, taximeter, which automatically calculated how much the passenger had to pay. But this little taxicab was about to achieve a fame far beyond that which could be imagined. By the beginning of September 1914 Paris had lost its glitter. War had been declared, the Germans were approaching the capital at an alarming pace and the French Government had decamped to Bordeaux leaving the defence of Paris to its military governor, General Joseph Simon Gallieni. Retiring from the army in April 1914, Gallieni was recalled in August to oversee the defence of Paris. His only directive: to defend Paris to the last. With the German army perilously close to the city, fate took a hand. Confusion on the German side, almost inevitable in the fog of war, together with a stroke of good fortune for the French revealed that there appeared to be a gap in the German defences. In order to take advantage of this, Gallieni needed to move his troops quickly. With the rail lines nearly crippled and few army motorised vehicles to hand, Gallieni instructed his staff to commission all of Paris’ taxis to drive French troops to the front. 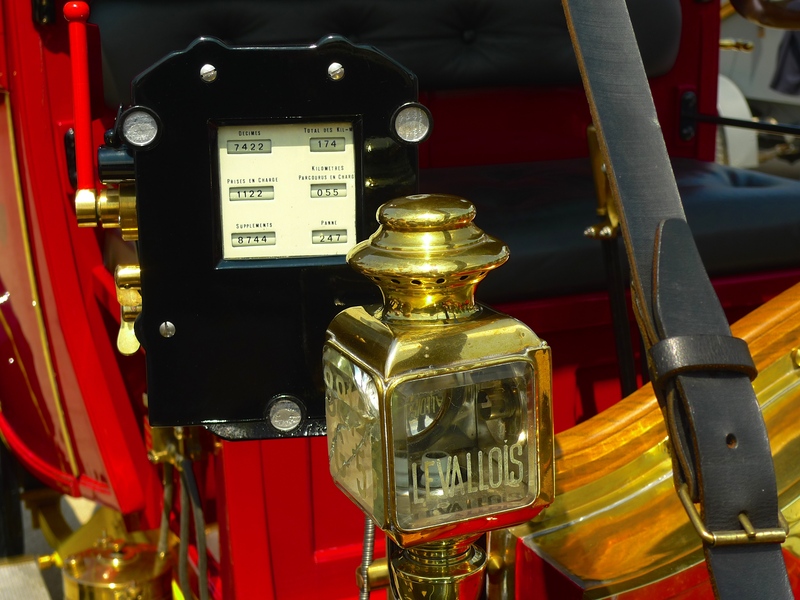 On the evening of 6th September, hundreds of taxicabs assembled on the Esplanade des Invalides and by morning they were heading off for the front. By the end of the following day some 600 taxis, each making several runs, had delivered over 3,000 troops. The taxi drivers, like taxi drivers the world over, insisted on being paid for their efforts but, after some hasty negotiations and in a spirit of patriotism, they finally settled for 27% of the full fare for each trip. The troops that the taxi drivers delivered became engaged in what we now know as the First Battle of the Marne, often known because of its significance as the Miracle of the Marne. It was fought from the 5th to the 12th September and it resulted in an Allied victory against the German army commanded by Chief of Staff, Helmuth von Moltke. It was also the prelude to the stalemate that was to ensue for most of the next four years. 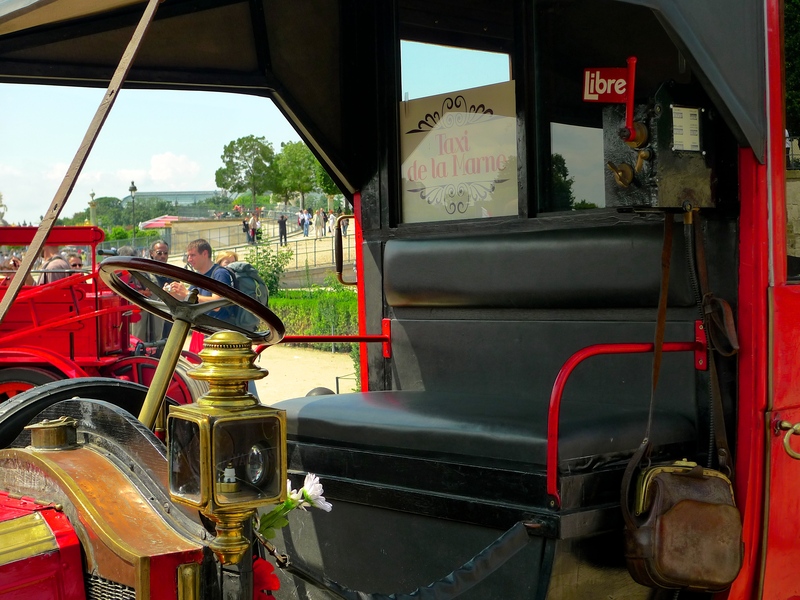 Looking at these two original Marne Taxis in the Jardin des Tuileries it was hard to imagine that they had actually taken part in this momentous event. But both were obviously well loved, well cared for and in pristine condition: a fitting tribute to their contribution to the Miracle of the Marne. LA FÊTE NATIONALE on 14th July is the centrepiece of the Parisian summer. It’s the French National Day and it commemorates the 1790 Fete de la Federation, held on the first anniversary of the storming of the Bastille on July 14, 1789. It also marks the start of the French holiday season. In Paris the day starts with the défilé, the parade of military and civilian services, marching down the Champs Elysées to be reviewed by the Président de la République and his army of guests. Before the défilé gets under way there is an opening ceremony at the end of which comes the opening fly-past by the French Air Force, the Armée de l’Air led by nine Alpha jets of the Patrouille de France, the French aerobatic display team who celebrate their 60th anniversary this year. Here I have to confess that I’m an aircraft enthusiast and so each year my viewing of the fly-past takes the same form. Half of me is inside watching on the TV and half of me is outside on my balcony watching and recording the aircraft as they fly overhead so close that I can almost reach up and touch them. At least that’s what I’ve done each year for the last fifteen years but this year I was forced into a last-minute change of plan. With about half an hour to go before the aircraft were due directly overhead with a wonderful sense of timing my next-door neighbours emerged onto their balcony to, rather over-enthusiastically I thought, tuck into a late breakfast. It was quite clear that my plans to record the fly-past free of the clatter of cutlery and minus a running commentary of the event about to unfold was a hopeless cause. What to do? Not being in the mood for one of those endless arguments that the French seem to enjoy so much I decided to implement Plan B.
I hastily grabbed my sound recorder and a microphone (Nagra LB and Rode NT4), left my apartment and set off up the street to a place close by where I knew I would get an excellent view of the fly-past and from where I could expect to get a good sound recording. From here I could see La Grande Arche de la Défense in one direction and the Arc de Triomphe in the other, the exact flight path of the aircraft. This is a place I pass every day so I know it well. The fact that it’s a bus station and the buses run during La Fête Nationale, and it was full of people, could have been seen as somewhat of a flaw in Plan B but I pressed on undeterred. I must say, it was well worth it. The view of the aircraft was simply spectacular even though in my hurry to implement Plan B I had left home without my camera. 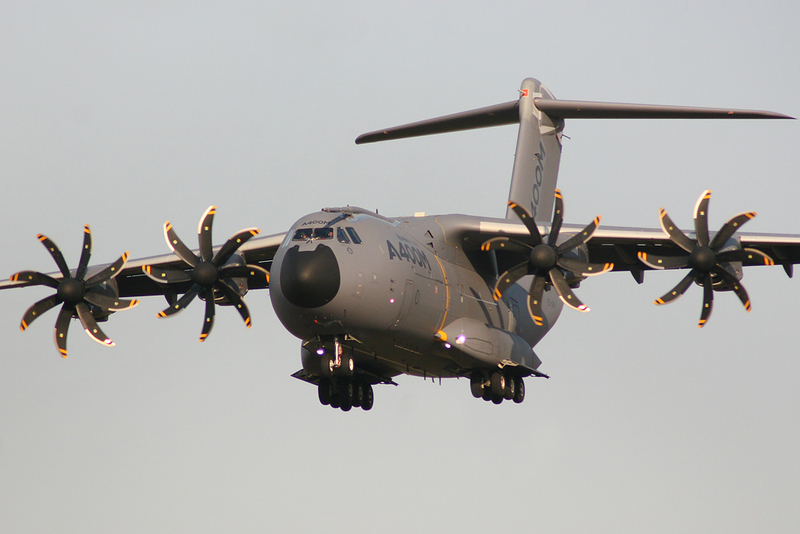 Apart from La Patrouille de France who are always good value, the star of the show for me was the appearance of the Airbus A400M, the multi-national four-engine turboprop military transport aircraft designed as a tactical airlifter with strategic capabilities. For those of you interested in these things the running order is listed below. As I said, I recorded these sounds from a bus station with lots of people around but I think that has added to the recording rather than detracting from it. For me, the sound of small, innocent children playing happily whilst war machines each costing millions pass overhead has a certain poignancy to it and the sound of a Paris bus starting its engine just ahead of five interceptor fighters passing overhead seems to be a sort of ‘poke in the eye’ to this extravagant display of military muscle. 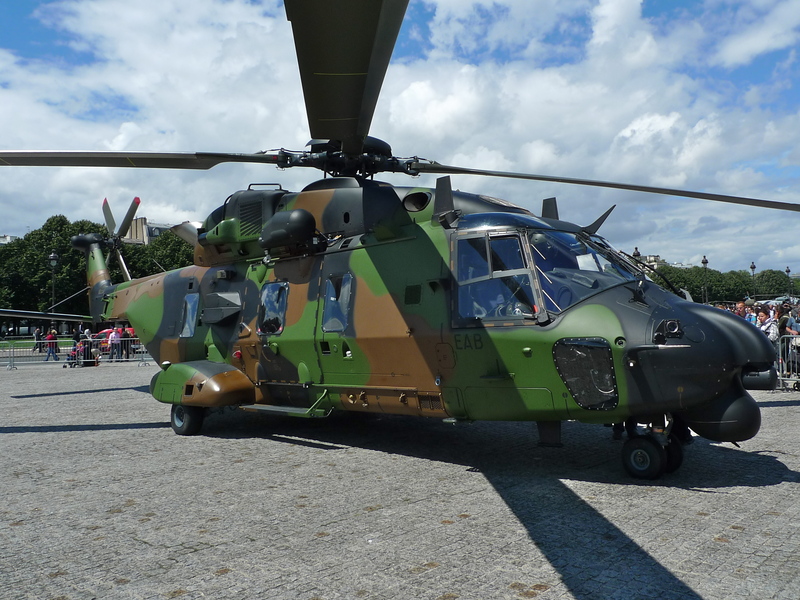 This year some aircraft from the Luftwaffe were invited to take part in the défilé aérien. The last time German aircraft flew over Paris it was in very different circumstances, which thank goodness are long behind us. While the aircraft appear at the beginning of the défilé in the Champs Elysées, the helicopter fly-past comes towards the end, some ninety minutes later. I decided not to stay at my bus stop location to record the helicopters, instead, it being a glorious sunny day, I decided to go home and record them from my garden. 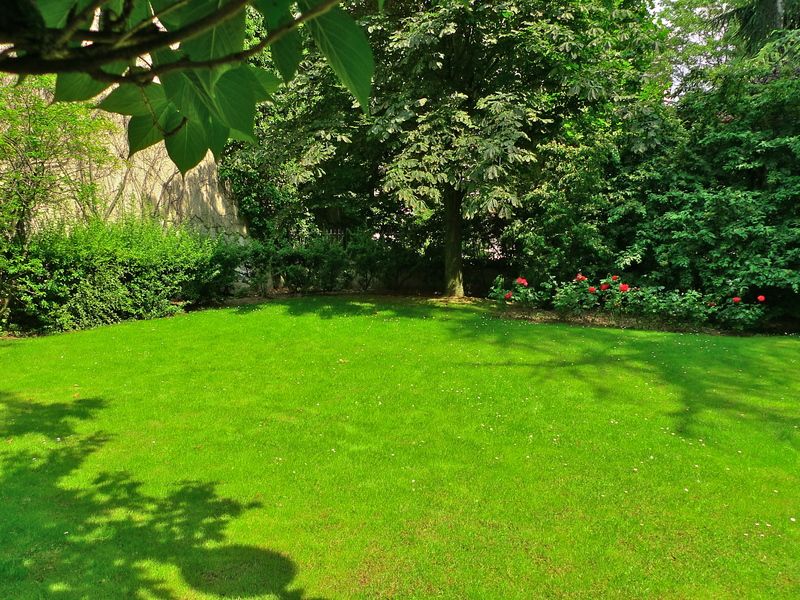 Well, it’s not actually my garden but it is the garden of my apartment building and I’ve been here so long that it feels as though it’s mine. It takes much less time for the helicopters to pass but their sounds are none the less dramatic. So that was my aircraft fix for yet another year. I always look forward to it and, despite my balcony drama, it didn’t disappoint. After a quick lunch I set off again to savour more of La Fête Nationale, this time ”Les Parisiens et les franciliens accueillent leurs soldats”. 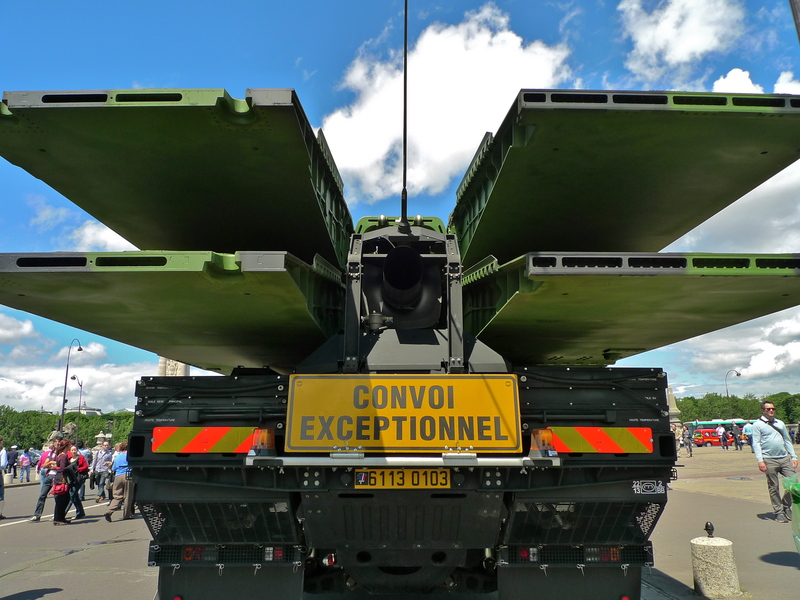 After the morning’s pageantry in the Champs Elysées some of the forces that took part in the défilé set up static displays in seven different places in and around Paris. 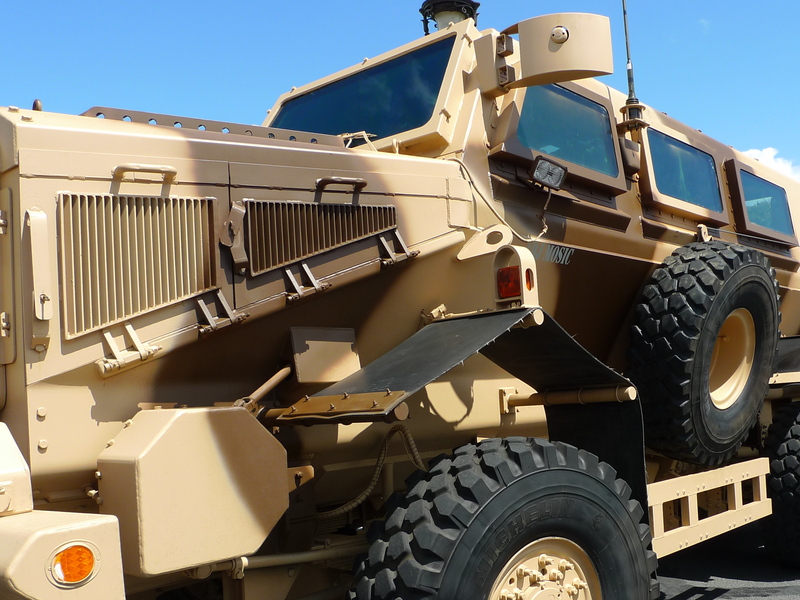 It’s a chance for the public to meet the military face to face. I went to the event at Les Invalides. 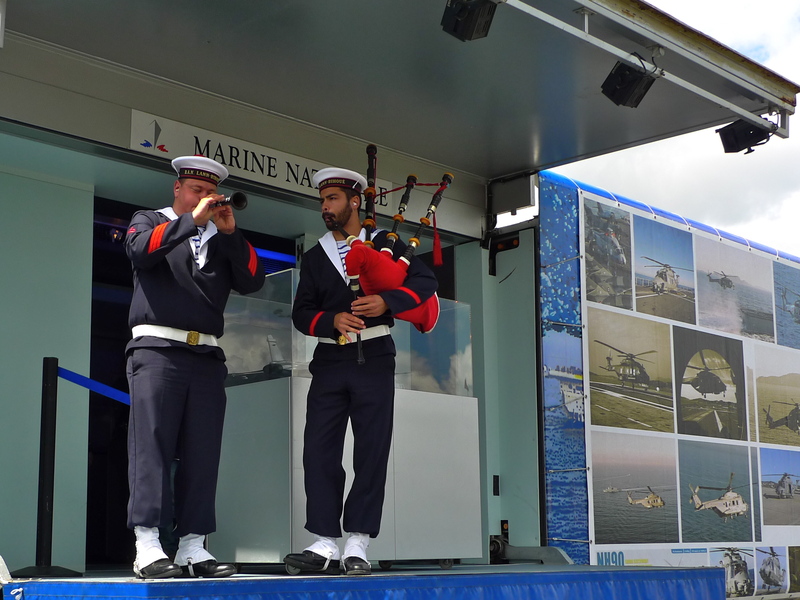 I went there last year and amongst the displays of military vehicles and hardware I was able to capture the sounds of le Bagad Lann-Bihoué, the very popular French Navy musical ensemble who specialise in playing distinctive Bretonne and Celtic music and a French Army Male Voice Choir. You can hear these sounds here. 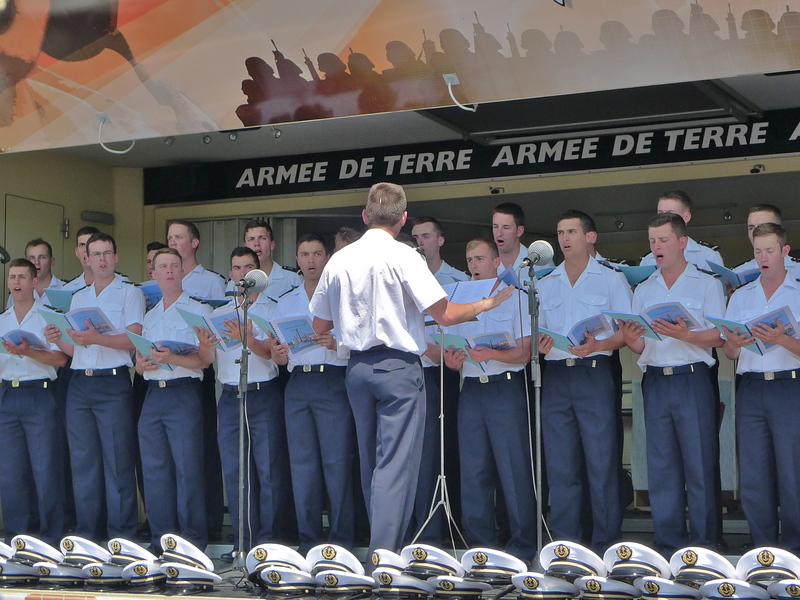 This year I came upon another male voice choir, this time from the choir school of the French Navy. These sounds were recorded without the aid of the public address system. The French Navy knob-twiddler-in-chief was clearly out of his depth trying to manage the public address system so, despite the appearance of a couple of blasts of feedback early on, he gave up and retreated to his hutch. Let’s hope he never becomes knob-twiddler-in-chief in a nuclear submarine! This year’s Fête Nationale came to a wonderful climax with a brilliant late-night concert in the Champs des Mars at the foot of Le Tour Eiffel which I watched on TV followed by an equally brilliant firework display which I also watched on TV but listened to from the balcony of my apartment. 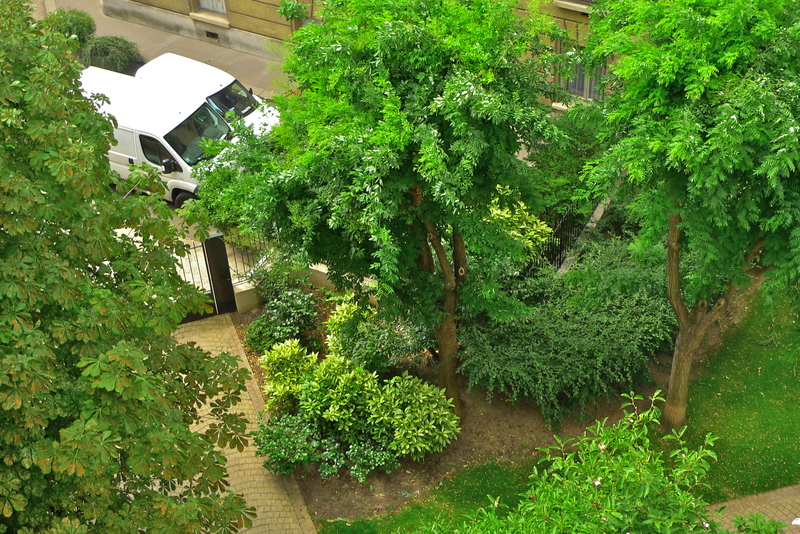 Le Tour Eiffel is in a direct line from my apartment balcony and I could get a perfect view of it – if it wasn’t for the houses in between! ON SATURDAY, THE CROWDS gathered, the rain held off and the Champs Elysées was decked out for La Fête Nationale and the annual defilé, the parade to mark 14th July, the French National Day. While the defilé comprising most branches of the French military and civilian services were parading on the ground, overhead, sixty-six aircraft from the Armée de l’Air, led by the French aerobatic display team, la Patrouille de France, flew directly over my apartment and down the Champs Elysées in perfect formation. From my balcony it seemed that I could almost reach up and touch them. I couldn’t of course, but I was perfectly placed to record their sounds, the sounds that on this day each year become some of the sounds that define Paris. 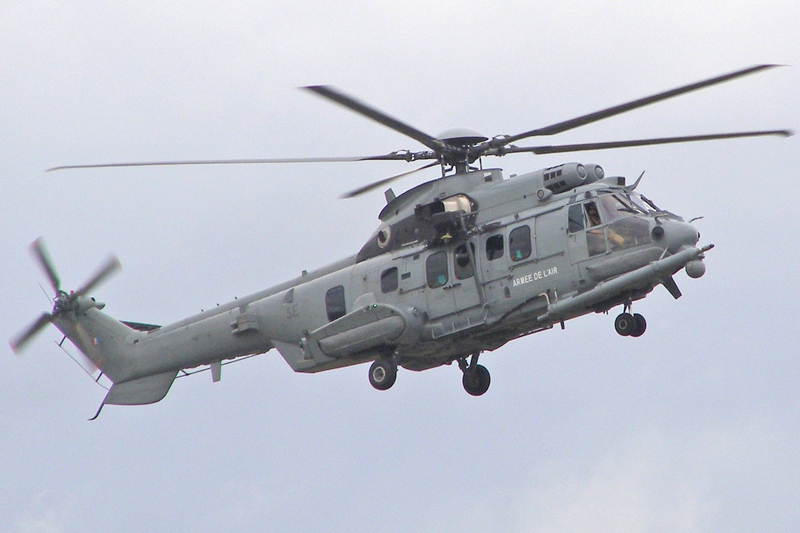 Some ninety minutes later, it was the turn of thirty-two helicopters from the Armée de l’Air, the Armée de Terre, the Gendarmerie Nationale and the Securite Civile, the French Civil Defence Agency. After the morning parade and fly-pasts in the Champs Elysées, culminating with the now customary parachutists landing with pin-point accuracy in front of the Président de la République, members of the government, diplomats and invited guests, the afternoon was taken over with operation “Les Parisiens et les franciliens accueillent leurs soldats”. Many of those who took part in the morning’s defilé scattered to various locations in Paris taking their equipment with them. 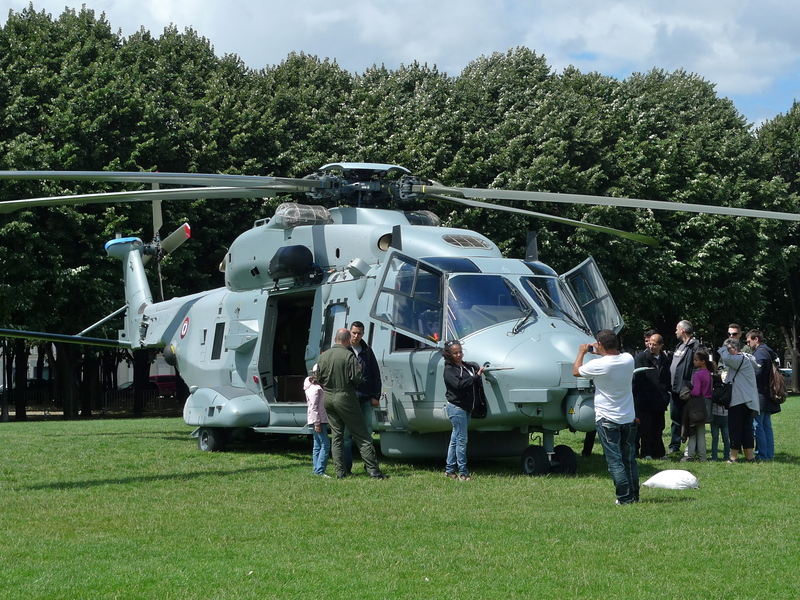 This was a chance for members of the public to meet the French armed forces and to learn at first hand what they do. It was also a wonderful opportunity to crawl all over very expensive things one would never get the chance to even get close to normally. I spent the afternoon at the Esplanade of Les Invalides. Some of the helicopters that took part in the morning’s fly-past were now parked here along with some other vehicles. Of course, I was interested in what was on show but I was also working, hunting for sounds and I wasn’t disappointed. I found these two men from le Bagad Lann-Bihoué, the very popular French Navy musical ensemble who specialise in playing distinctive Bretonne and Celtic music. 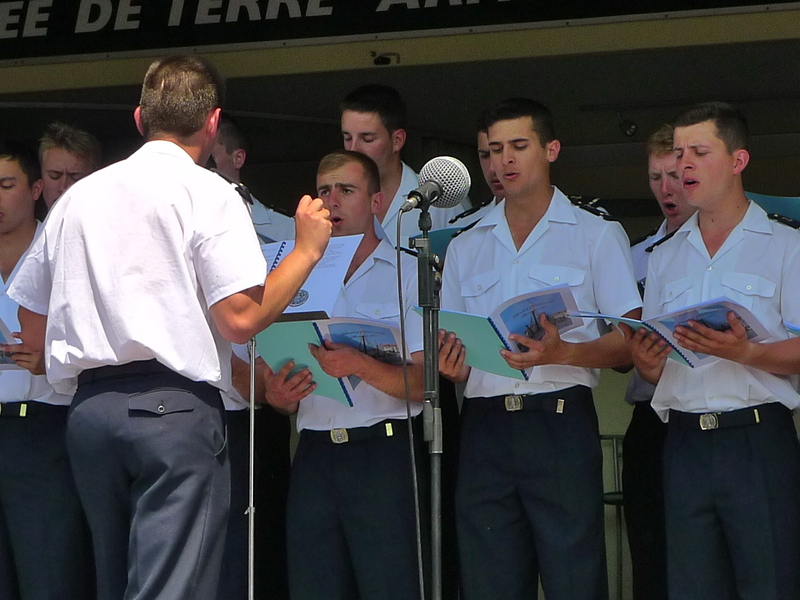 And from the Navy to the Army … and representatives from Le Choeur de l’Armée Francaise, the French Army Choir. The 14th July has become a fixed point in my calendar. I’m not French but I have learned to enjoy La Fête Nationale and all its sights and sounds. Although the defilé in the Champs Elysées is carried out with meticulous precision things don’t always go to plan. This year, the parachutist’s display at the end of the parade was more spectacular than ever. All of them landed inch perfect and bang on target but unfortunately, one of them was injured on landing and, unable to walk, he had to be carried off to one side. These things happen and François Holland, Président de la République, was quick to walk over to have a word with him. C’est la vie! I’D JUST GOT HOME. I was sitting on my balcony enjoying a cup of tea in the summer sunshine. Down below, the white-van men were present, as always. All was well with the world – until this happened! Was Paris under attack? Or maybe somehow I’d been teleported to Tripoli. Even the white-van men came to life and took notice. It was a surprise but the answer was simple. The clue was when a single Alpha Jet from the Patrouille de France passed overhead a few moments earlier – L’Armée de l’Air, the French Air Force, was in town. 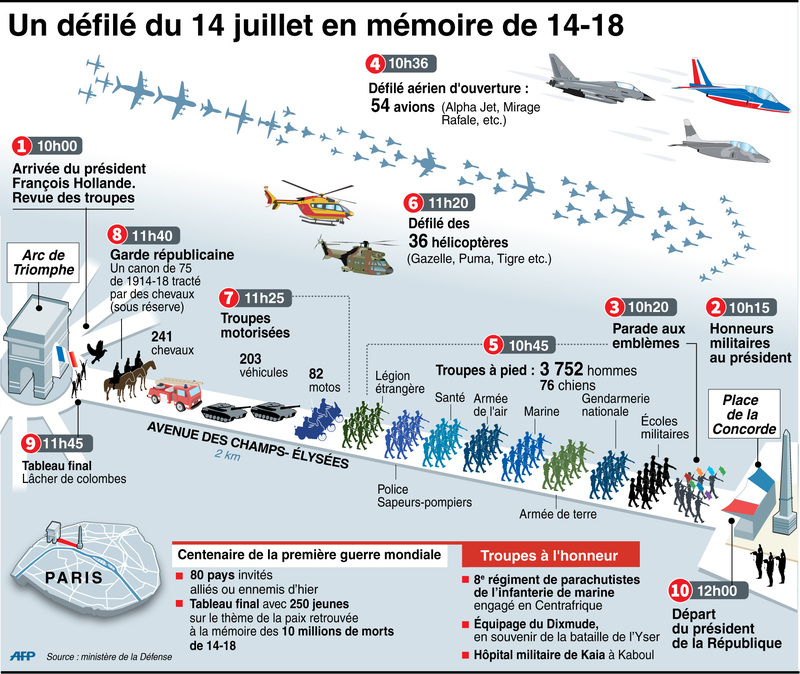 Next week, on 14th July, France celebrates La Fête Nationale and as part of the défilé, the parade along the Champs Elysées, the French Air Force’s contribution will be a fly-past. This was their rehearsal. I always have a sound recorder close to hand so, although I missed the sound of the single Alpha Jet, I did manage to capture most of the rest of the rehearsal. Why just one Alpha Jet? Simple, the Patrouille de France is the French Aerobatic Display Team and they don’t need to rehearse how to fly in a straight line! Just the leader flies the route in the rehearsal but all the other elements of the fly-past turn out in full. 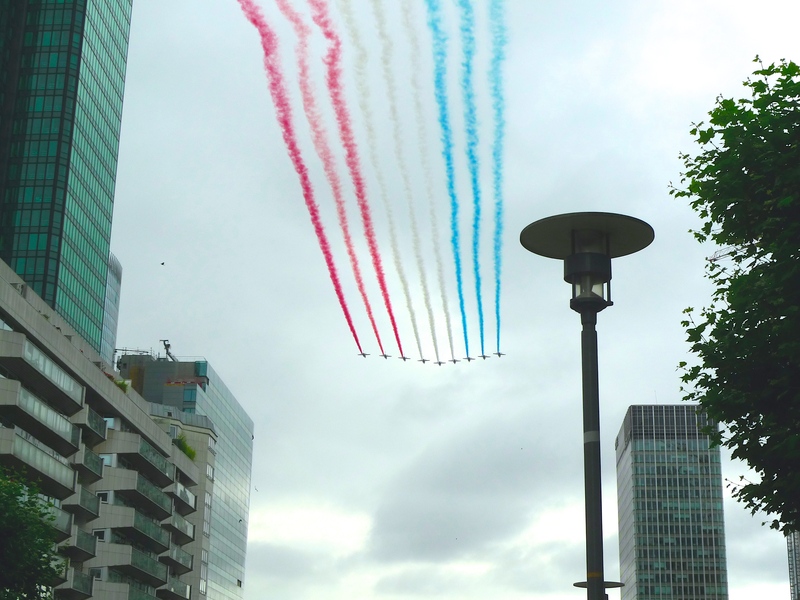 Each element of the fly-past meets at La Défense and then turns to the east and flies directly over the Avenue Charles de Gaulle, the Avenue de la Grande Armée, the Arc de Triomphe and the Champs Élysées – including directly over my apartment. I get a perfect view. 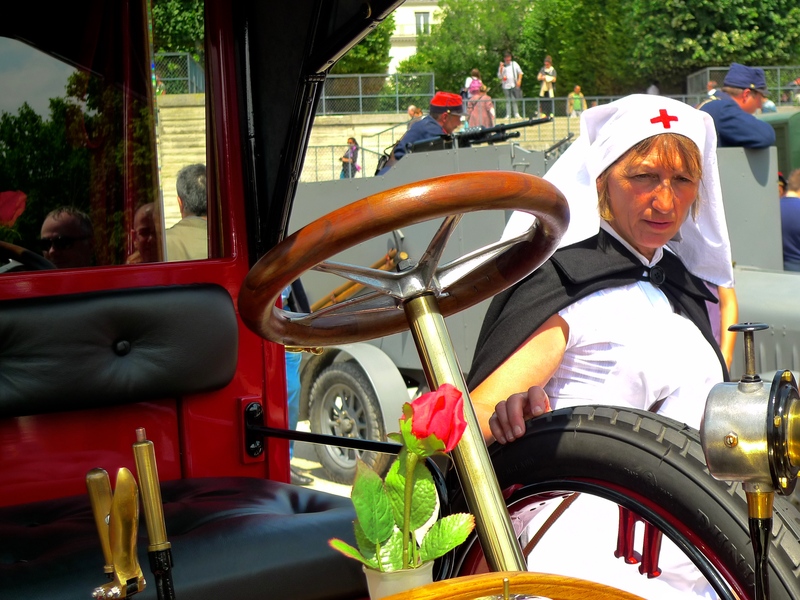 On Thursday next week, the TV outside-broadcast crews will be in place to broadcast the défilé and the fly-past. A TV audience of several million will watch and listen to the fly-past, not to mention the thousands watching and listening in the streets. But unlike them, you heard it here first! 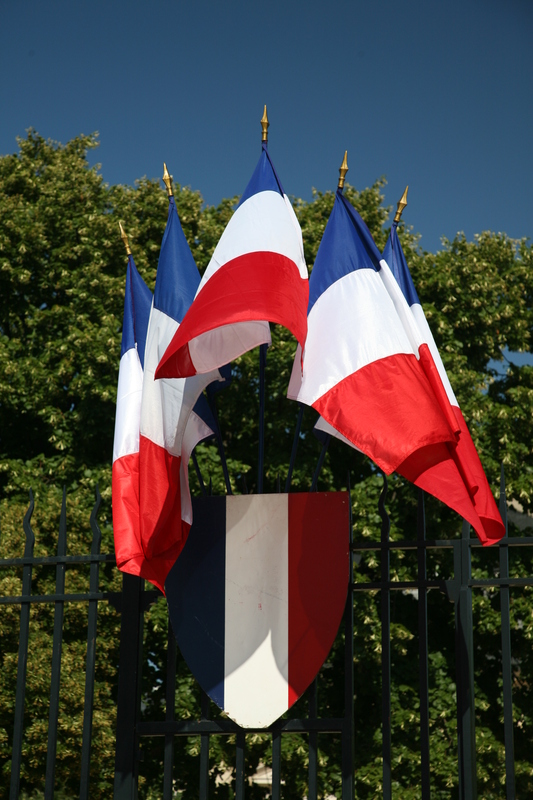 Today is the 14th July, La Fête Nationale, the French national holiday which is celebrated on this day each year. In France, it is more commonly called le quatorze juillet. The British usually refer to it, although the French never do, as Bastille Day which is not surprising since it commemorates the 1790 Fête de la Fédération, held on the first anniversary of the storming of the Bastille on 14 July 1789. A défilé, a parade, is held on the morning of 14th July, on the Champs-Élysées in Paris with the President de la Republic taking the salute. 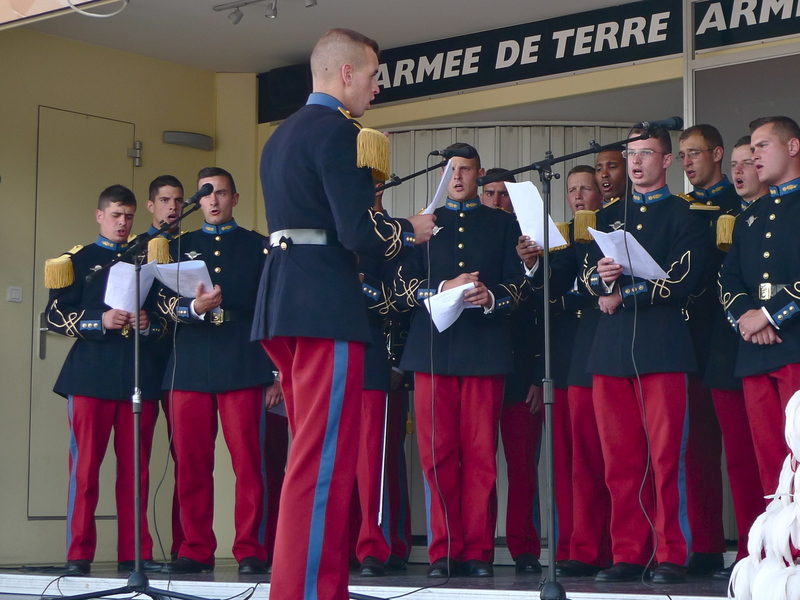 Today, the parade included the usual representatives from all branches of the French armed forces from the cadets of the military academy of Saint-Cyr together with their navy and air force cousins to the seasoned representatives of the French Foreign Legion who as usual stole the show with their beards, axes, brown aprons and funereal paced marching. 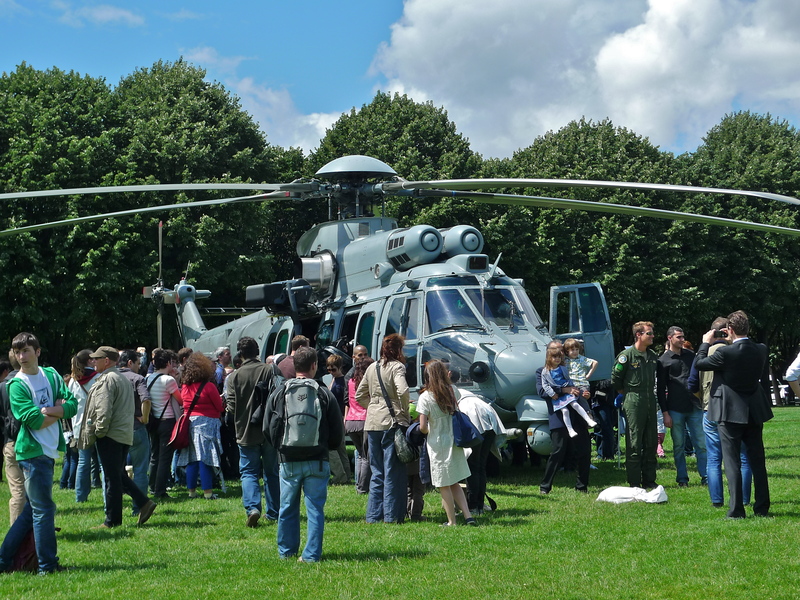 The civilian services were also represented by the Police Nationale, the Gendarmerie and the Fire service. If the Foreign Legion stole the show on the ground the Patrouille de France stole the show in the air. Led this year for the first time by a woman, Virginie Guyot, the Patrouille de France today put on an immaculate display of formation flying directly over my apartment and along the Champs-Élysées. A fly past of other military aircraft and helicopters followed. In recent times, it has become customary to invite units from France’s allies to the parade; in 2004 during the centenary of the Entente Cordiale, British troops (the band of the Royal Marines, the Household Cavalry, the Grenadier Guards and the King’s Troop, Royal Horse Artillery) led the défilé for the first time, with the Red Arrows flying overhead. I was there and I saw it with, I admit, a tear in my eye. In 2007 the German 26th Airborne Brigade led the march followed by British Royal Marines. This year it was the turn of representatives from France’s former African colonies to share the parade and they brought a unique splash of colour to the proceedings. Usually the weather is very kind for le quatorze juillet and the sun is guaranteed to shine on the parade, but not today. As the défilé began the heavens opened and the rain came down with a vengeance and most of those marching down the Champs-Élysées looked very much as though they wished they were somewhere else. Still, the weather didn’t prevent the fly-past much to my delight. The fly-past of the aircraft happened at just after 10.30 this morning and the helicopters came along almost an hour later. I had my sound recorder and microphone set up on my balcony in good time. Today I was using my new Nagra LB recorder and an Audio-Technica 8022 X-Y stereo microphone. As a back-up I used my Zoom H4N Handy recorder with a Rode NT-4 X-Y stereo microphone. At 10.20 I switched both recorders on ready to record. 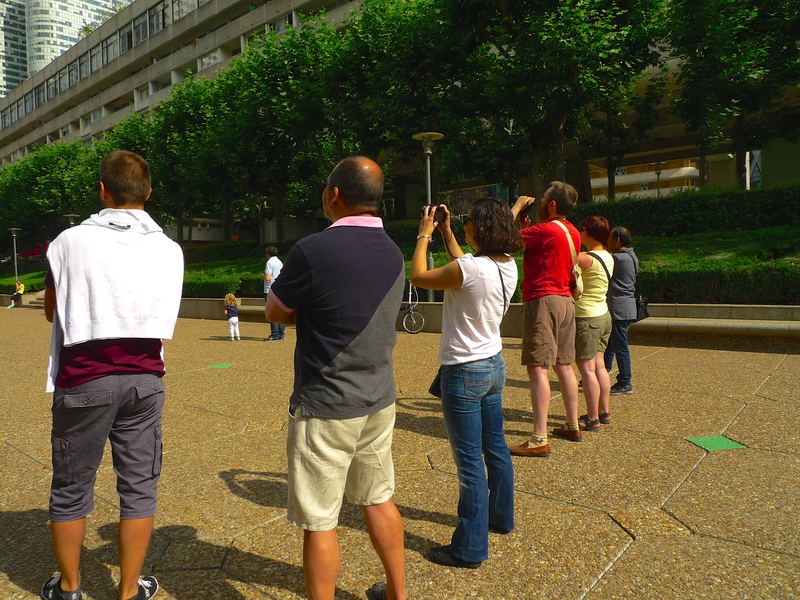 I then came inside to watch the progress of the défilé on the TV and as soon as they showed the Patrouille emerging over La Défense I went back out to the balcony and switched to record. Thirty seconds later they were directly overhead with red, white and blue smoke streaming behind them. They were followed by further waves of jet aircraft with the propeller aircraft bringing up the rear. At five minutes into the fly-past the rain came down even harder as you can hear as the last few aircraft come over. An hour later it was the turn of the helicopters and by this time the weather was so appalling that I wouldn’t have been surprised if they had given up and gone home. The sky was so grey and dark that the TV cameras didn’t pick up the helicopters at La Défense at first but I was prepared anyway. I turned the recorders on and presently heard the distinctive sound of very large helicopters approaching. The helicopter fly-past was shorter than usual, presumably some of the smaller aircraft were pulled at the last-minute for safety’s sake. During the afternoon of le quatorze juillet, the President de la Republic used to give an interview to the press, discussing the situation of the country, recent events and projects for the future. The current President, Nicolas Sarkozy, has chosen not to do that. It was also customary for the President to hold a garden party at the Palais de l’Elysée, but not this year. President Sarkozy’s government is mired in financial scandal, including l’affaire Bettancourt, as well as a minister claiming €12,000 in expenses for cigars and another minister spending €116,500 on a private jet flight to an aid conference on Haiti. Last year’s garden party cost €730,000 so, against this background and given that his popularity is at its lowest ever, President Sarkozy has forsaken the garden party this year. Article 17 of the French Constitution gives the President the authority to pardon criminals, and since 1991 the President has pardoned many petty offenders (mainly for traffic offences) on 14th July. The former President, Jaques Chirac had an absolute field day with this particular piece of executive privilege. In 2007, President Sarkozy declined to continue the practice. The rain has stopped, the sun is shining and it’s a beautiful evening which bodes well for the firework displays later. Note: These recordings were made in BWF and compressed to MP3 for this post.